Flat feet and flexible feet are common inherited weak foot structures that can cause a multitude of problems. With flat feet, there is minimal to no arches and the feet will flatten to the ground. With flexible feet there are often good arches when you’re not standing but the arches flatten to the ground or pull inward when standing and walking. Unfortunately, flat or flexible feet are not meant for standing, walking or exercising on hard flat surfaces. As a result, those with flat or flexible feet can have various problems ranging from generalized foot pain to heel, ankle, knee and even back pain. Flat or flexible feet will often cause spreading or shifting of the bones in the front part of the feet, resulting in painful bunions, hammertoes, and arthritic changes and can also cause painful ingrown or deformed toenails, corns and calluses. Flat or flexible feet can cause major problems for children and young adults that are active in sports, especially those activities that involve running. For older adults, the foot structure can become weaker over time with increased flatting of the arches and resultant problems. At the Westwood Foot Clinic in Golden Valley, we are specialists in the treatment of flat feet and flexible feet that flatten to the ground. 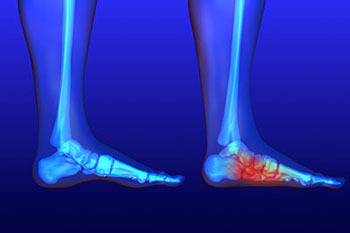 After a thorough evaluation of your feet along with gait analysis, we can determine the best treatment for you. This often involves prescription foot orthotics - custom made shoe inserts that will shift and realign your feet into a more balanced position. We also treat the various problems caused by flat or flexible feet such as ingrown or deformed toenails, corns and calluses, hammertoes or bunions. If you or someone you care about is experiencing problems from flat or flexible feet that flatten to the ground, then click here or call (763) 231-2341 now to schedule an appointment with Dr. Silver at the Westwood Foot Clinic in Golden Valley.